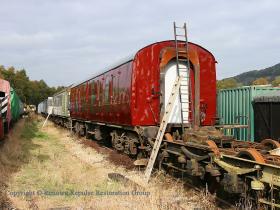 RRRG's mess and workshop coach owned by a member RRRG members currently own three coaches. The closest vehicle in the above picture is being used as a spares storage vehicle. It is currently in IntercCity livery, but a start has been made this summer on restoring its bodywork and repainting it. This is being undertaken on an as and when basis (and is obviously weather dependant) so as not to slow progress with 50030. The vehicle in the background is another Mark 1 BG no 80777 which is also owned by an RRRG member and is in the process of being restored to operational condition by Peak Rail staff for use on the operational rake. 18th October 2009. RRRG members currently own three coaches. The closest vehicle in the above picture is being used as a spares storage vehicle. 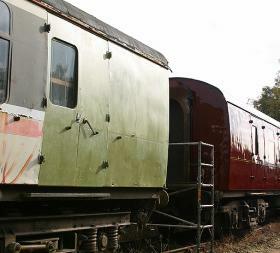 It is currently in IntercCity livery, but a start has been made this summer on restoring its bodywork and repainting it. This is being undertaken on an as and when basis (and is obviously weather dependant) so as not to slow progress with 50030. The vehicle in the background is another Mark 1 BG no 80777 which is also owned by an RRRG member and is in the process of being restored to operational condition by Peak Rail staff for use on the operational rake. 18th October 2009. Mark 1 BG 80777 under restoration for Peak Rail use The other end of the E80777 is seen showing the excellent condition that the vehicle is being restored to. 18th October 2009. 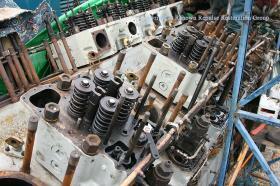 The other end of the E80777 is seen showing the excellent condition that the vehicle is being restored to. 18th October 2009. RRRG's second coach seen at Darley Dale before it moved to Rowsley RRRG working members Chris and Tom are seen looking over RRRG's most recent acquisition, at Darley Dale. This coach has been bought by a small consortium of RRRG members. 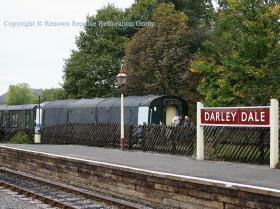 The vehicle is was later moved up to Rowsley where it is used for the time being to provide covered storage. 18th October 2009. RRRG working members Chris and Tom are seen looking over RRRG's most recent acquisition, at Darley Dale. This coach has been bought by a small consortium of RRRG members. The vehicle is was later moved up to Rowsley where it is used for the time being to provide covered storage. 18th October 2009. Overhauled exhauster at Bowers During September 2009 RRRG were fortunate enough to secure a fully overhauled (off the shelf) class 50 exhauster from Unipart Rail at Doncaster, along with a few other minor items. Although the exhauster has been fully overhauled, and has been in covered store in Unipart's warehouse, given the unknown and likely to have been a considerable period of storage it was felt best to move it to Bowers to have them check it over and give it a test. As such the 23rd October 2009 saw another day of shuffling equipment around. The day started with RRRG members Steve Tripp and Mark Burrows collecting the exhauster from Doncaster and taking it to Bowers Electrical at Heanor. During September 2009 RRRG were fortunate enough to secure a fully overhauled (off the shelf) class 50 exhauster from Unipart Rail at Doncaster, along with a few other minor items. Although the exhauster has been fully overhauled, and has been in covered store in Unipart's warehouse, given the unknown and likely to have been a considerable period of storage it was felt best to move it to Bowers to have them check it over and give it a test. 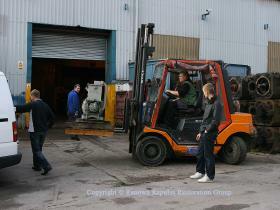 As such the 23rd October 2009 saw another day of shuffling equipment around. The day started with RRRG members Steve Tripp and Mark Burrows collecting the exhauster from Doncaster and taking it to Bowers Electrical at Heanor. Overhauled exhauster going into Bowers workshop The newly purchased overhauled exhauster is seen here in the process of being unloaded and taken into Bowers workshop. 23rd October 2009. 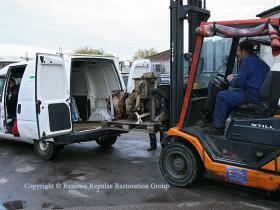 The newly purchased overhauled exhauster is seen here in the process of being unloaded and taken into Bowers workshop. 23rd October 2009. Old class 50 spare exhauster at Bowers This exhauster was obtained along with the locomotives back in 2002, and was externally in a poor condition at that time. The machine does however rotate freely and internally looks to be reasonable on first inspection. The plan is for Bowers to overhaul components from this machine and one of the Class 37 exhausters obtained from Booths in June 2009 to make one good overhauled Class 50 exhauster. This will give us a pair (with the exhauster obtained from Unipart) for use in 50030. The exhausters currently in 50030 will be put into store for use in 50029 when the time to overhaul machines for that locomotive comes. 23rd October 2009. This exhauster was obtained along with the locomotives back in 2002, and was externally in a poor condition at that time. The machine does however rotate freely and internally looks to be reasonable on first inspection. The plan is for Bowers to overhaul components from this machine and one of the Class 37 exhausters obtained from Booths in June 2009 to make one good overhauled Class 50 exhauster. 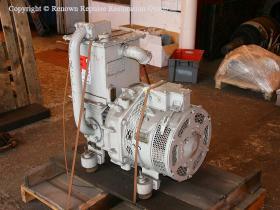 This will give us a pair (with the exhauster obtained from Unipart) for use in 50030. The exhausters currently in 50030 will be put into store for use in 50029 when the time to overhaul machines for that locomotive comes. 23rd October 2009. Ex-Unipart overhauled Class 50 exhauster at Bowers After delivering the exhauster (seen above in Bowers' workshop), we backtracked to Rotherham to collect a traction motor blower from Booths that we had been unable to collect earlier in the year. This was then taken to Rowsley for storage, where the opportunity was taken to load our old spare Class 50 exhauster and take that to Bowers Electrical as well. 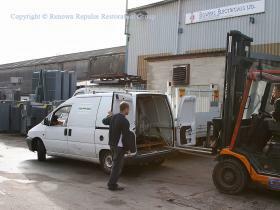 After delivering the exhauster (seen above in Bowers' workshop), we backtracked to Rotherham to collect a traction motor blower from Booths that we had been unable to collect earlier in the year. This was then taken to Rowsley for storage, where the opportunity was taken to load our old spare Class 50 exhauster and take that to Bowers Electrical as well. Overhauled exhauster at Bowers The excellent condition of the overhauled exhauster acquired from Unipart can be seen in this view. 23rd October 2009. 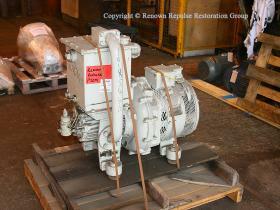 The excellent condition of the overhauled exhauster acquired from Unipart can be seen in this view. 23rd October 2009. Work on the ex-50008 power unit in October 2009 Peter Carter and Ian Kemp are seen working on the ex-50008 power unit which is progressing well through its overhaul. 18th October 2009. 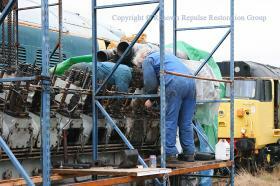 Peter Carter and Ian Kemp are seen working on the ex-50008 power unit which is progressing well through its overhaul. 18th October 2009. Refurbished cylinder heads fitted to ex-50008 power unit At this stage there were eight of the overhauled cylinder heads refitted to the power unit, six of which are seen in the picture above. 18th October 2009. At this stage there were eight of the overhauled cylinder heads refitted to the power unit, six of which are seen in the picture above. 18th October 2009.